From Public News Service . . .
A large majority of Montanans consider themselves outdoor fanatics and believe the state’s natural resources should be protected, according to the ninth annual Conservation in the West Poll from Colorado College. Eighty percent of respondents in Montana say they are outdoor enthusiasts – the highest number among the eight western states polled. Montanans also appear to reject the Interior Department’s energy dominance agenda, with 60 percent preferring to protect clean air, water and wildlife habitats, compared to 30 percent who want to pursue more domestic energy sources. The greater sage grouse conservation plan is drawing fire from both sides . . .
Environmental groups sued Thursday to force the Obama administration to impose more restrictions on oil and gas drilling, grazing and other activities blamed for the decline of greater sage grouse across the American West. A sweeping sage grouse conservation effort that the government announced last September is riddled with loopholes and will not be enough to protect the bird from extinction, according to the lawsuit filed in U.S. District Court in Idaho. It follows several legal challenges against the same rules from the opposite end of the political spectrum. Mining companies, ranchers and officials in Utah, Idaho and Nevada argue that the administration’s actions will impede economic development. Tristan Scott over at the Flathead Beacon has a long, very interesting article discussing the conservation movement on the right side of the political spectrum. . .
It’s late August in Montana and the North Fork of the Flathead River is running low and slow, snaking through a chalky corridor of wildfire smoke, its steep banks inscribed with the tracks of deer and grizzly bears, wallpapered with a mix of blackened snags and young lodgepole pine, and scored with clusters of radiant fireweed. The smoke blotting the sky overhead hangs in contrast against the transparency of the water below, magnifying the burnished bottom-stones and the shimmering flashes of bull trout, rainbows and cutties. Somewhere downstream from the Glacier Rim river access, about 10 miles north of Columbia Falls, a ClackaCraft drift boat cuts through the glassy surface, which longtime fly-fishing guide and oarsman Irv Heitz navigates from his perch in the middle of the boat, rowing and setting his clients up on fish. At the bow, U.S. Sen. Steve Daines, dressed in zip-off Columbia cargo pants and a T-shirt, leans against the boat’s leg bracket, casting a dry fly at the tail of a riffle that’s usually filthy with trout. Everyone knows to take government budget numbers with a grain of salt, right? Still, this overview of the money being directed towards sage grouse conservation is pretty interesting . . . Spending on a government-sponsored initiative to help struggling sage grouse populations in the West is projected to exceed $750 million by 2018. The U.S. Department of Agriculture said Thursday the money will conserve an estimated 8 million acres of sage grouse habitat. 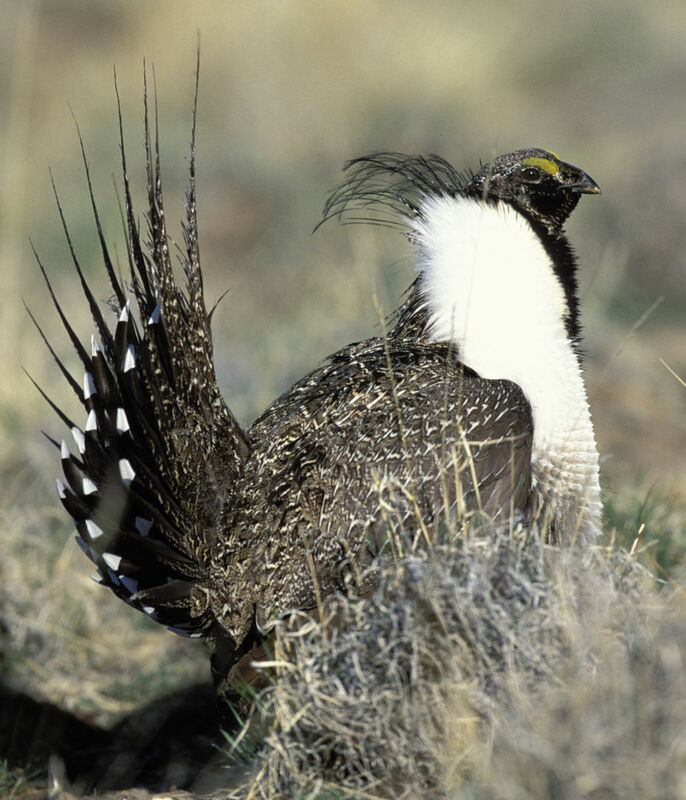 Federal officials are more than halfway to that goal since starting the Sage Grouse Initiative in 2010. The chicken-sized birds are found in 11 Western states. They’re being considered for federal protections after their numbers plummeted in recent decades. The Flathead National Forest is providing space for the spring Northern Continental Divide Ecosystem meeting. Here’s the press release . . . The public is invited to participate in the upcoming Northern Continental Divide Ecosystem (NCDE) Spring Meeting hosted by the Flathead National Forest. The meeting is scheduled from 10:00 AM to 3:30 PM on April 23, 2014 at the Hungry Horse/Glacier View and Spotted Bear Ranger District Office located at 10 Hungry Horse Drive in Hungry Horse, Montana. During the meeting there will be an update on the time line and next steps for the Conservation Strategy Plan, efforts to provide a new Grizzly Bear Lesson Plan for high schools, bear mortality rates for 2013 and bear management spring activity. Click here for the NCDE Spring Meeting agenda. Some good news from British Columbia: Teck Resources bought up a sizable amount of land (almost 28 square miles) in southeast British Columbia for conservation purposes, most of it in the Flathead River drainage. The Vancouver Sun has the story, including a map . . .
Mining giant Teck Resources will spend $19 million to buy thousands of hectares of land in southeast British Columbia for conservation, the company announced Thursday. The company said it purchased more than 7,000 hectares in the Elk and Flathead river valleys from Tembec Inc., not for mining but to preserve wildlife and fish habitat. “While not amenable to mining, the lands have the potential to be used for conservation purposes,” the company announced. Company president Don Lindsay said Teck will work with area First Nations and conservation groups to ensure the protection of key wildlife and fish habitat. If it passes, the open space bond on this November’s ballot is likely to have some impact on the North Fork in the future. Michael Jamison has a good write-up on the issue in the October 13, 2008 online edition of the Missoulian . . .
Flathead County, home to the three fastest-growing cities in Montana, is losing agricultural and forest open space at a tremendous rate, as developers build subdivisions across rural lands. Whether locals can afford to stop it is another matter entirely. On Nov. 4, when voters go to the polls here, they’ll be asked to back a $10 million open space bond, money that will buy rural land – or at least conservation easements on land. The idea is to secure recreational access, especially at waterfront sites, to protect wildlife, to preserve sweeping views, to ensure water quality and to allow the Flathead’s rural way of life to persist into coming decades. And residents appear to agree. A survey of Flathead Valley residents showed two-thirds of those polled supported the 20-year bond, which will cost the owner of a $200,000 home about $19 a year.